I wanted to give others the opportunity to participate in an upcoming Group Read we are having over at Goodreads for a popular author, Jean Plaidy aka Victoria Holt. 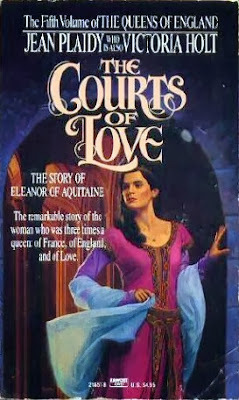 On December 26, 2013 we are scheduled to start reading The Courts of Love at the forum and anyone can join in. These are loosely formatted: there is not a formal reading schedule, simply pop in and share thoughts or lurk as you wish. When I look back over my long and tempestuous life, I can see that much of what happened to me—my triumphs and most of my misfortunes—was due to my passionate relationships with men. I was a woman who considered herself their equal—and in many ways their superior—but it seemed that I depended on them, while seeking to be the dominant partner—an attitude which could hardly be expected to bring about a harmonious existence. In this majestic and sweeping story, set against a backdrop of medieval politics, intrigue, and strife, Jean Plaidy weaves a tapestry of love, passion, betrayal, and heartbreak—and reveals the life of a most remarkable woman whose iron will and political savvy enabled her to hold her own against the most powerful men of her. Feel free to join in the discussions over at Goodreads! Hope to see you there!